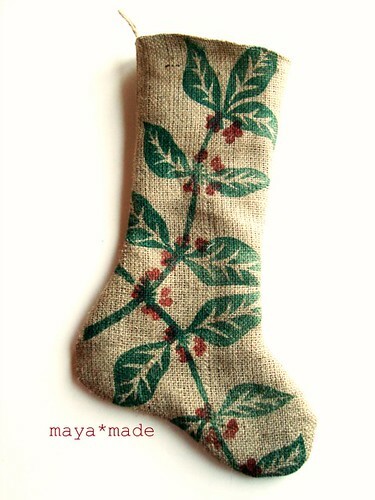 This stocking was made with a coffee sack that had originally been printed with green coffee vines and red coffee "berries" for organic Guatemalan beans. It was just begging to be repurposed for the holidays. 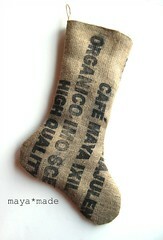 I had so much fun making coffee sack stockings last year, that I made several and Parents.com discovered them. I was contacted this fall about featuring them in their 100 days of Holidays... if I would consider sharing a how-to. But, of course! Here they are on Parents.com with a nice selection of all kinds of stockings to get inspired by. 1. Trace an existing Christmas stocking onto paper. Add 1 inch around the entire shape and cut out to use as template. 2. Using template, cut out two stocking pieces of the lining and two pieces of the burlap. 3. Pin together stocking lining (right side to right side) and sew up all sides, leaving the top open. 4. Do the same with the burlap and turn right side out. 5. Insert lining into burlap and fold the tops in towards each other. Pin in place and add a loop of jute on the back at the seam. Top stitch all around the circumference of the opening. Done! Coffee beans vines are very "holiday" aren't they? I like. I was wondering where you get your coffee sacks? I love all your beautiful projects with them and would love to get my hands on some myself. Thanks! too cute! would love using this idea instead of a gift bag! How perfectly Christmas-y! I just love this! I like your blog, This looks great! Thanks for the nice work. Hello! Oh how many wonderful things I have seen when reading your blog! Thank you for lovely moments and ispiration! What a good idea! I love the look of these and they seem super simple to make. Thanks for sharing this idea and how-to! Hello Maya! I'm your new fan! I'm looking around your lovely blog - today - yesterday...It's full of wonderful things which I just love! Thank you for sharing so many great ideas and giving inspiration! Today I made 2 things inspired by you! What a sweet idea Maya.